In the last few financial freedom updates, I talked a little about my spouse leaving her full-time work. While there was a bit of financial juggling to do, there was one major decision that we had to make with regards to her pension. We had to decide on either leaving her defined benefit pension in place or taking the lump sum (commuted value) and investing it ourselves in a locked-in retirement account (LIRA). Before making a decision on the defined benefit pension, about a year ago my wife also had a defined contribution pension that was transferred into a LIRA with Questrade. Transferring that pension was an easy choice as the benefits during retirement were not defined but based on investment returns. With the high MERs that the provider was charging, it was an easy choice to take the money and invest it myself. We decided to invest in low-cost index ETFs for that amount. First for new readers out there, a defined benefit pension is typically offered by government employers and is considered a major benefit of working for the civil service. In this type of pension, the requirement is that you work in government for 25-30 years, contribute a small portion of your salary towards the pension and in return, you get 60-70% of your working income during retirement (some pensions are even indexed to inflation). It really is a great deal for employees willing to stick it out with the same employer for the long term. More details about defined benefit pensions here. The decision on whether or not to take the commuted value of a defined benefit pension is a bit more involved. Mostly because the income provided during retirement is defined and for the most part, secure. There is something about the certainty of regular recurring income that is enticing. With any major decision like this, I like to review the pros and cons. For a numbers guy like me, there were also a number of intangible and subjective points to consider. I will admit that the numbers made a big impact on my decision. The pension statement showed at age 60 (about 22 years from now), my wife would be entitled to $7,700/year for life (not indexed to inflation). While not a huge amount during retirement, it would be a nice guaranteed base income. But also note that the $7,700/year includes the CPP bridge benefit. This means that the pension actually gets reduced at age 65, but CPP will kick in, so overall income should stay relatively the same. When my wife left her job, she received some paperwork indicating her pension options. This included: leave the pension in place; transfer to a new pension (if applicable); or withdraw the commuted value of $54,500. Due to the size of the commuted value, we had the option to transfer the full amount to a LIRA and avoid paying any taxes – at least until withdrawals begin in the future (55 is the minimum age in NL). A defined benefit pension is essentially the same as buying an annuity. Both will give you income for life, but you lose the balance once you pass away (some pensions and annuities allow the spouse to get a portion of the benefit). Using an online annuity calculator, a 60 year old female buying a registered annuity provides about $5,000/year income for every $100,000 purchased. So to get an equivalent income during retirement, we would need to purchase about $150,000 worth of annuities to generate about $7,700/year income. What rate of return would I need to turn $54,500 into $150,000 in 22 years (by age 60)? The compounded annual rate of return (CAGR) works out to be 4.71%. The DIY return required is likely less than this because the pension benefit gets reduced @ age 65, but we will leave that complexity out of this analysis. So now the question becomes, do I think that a diversified low-cost passive ETF portfolio can at least match 4.71%? Historic long-term market returns show that returns will likely be higher than this. We also get the added benefit of choosing how much to withdraw from the portfolio and potentially, there is flexibility in how much money is left behind to the next generation. While the numbers show that long-term market returns support taking the commuted value of the pension, there are other intangible factors as well that added to our decision. Some of these factors are specific to the NL pension. Removed health benefits – Some pensions allow pensioners access to medical benefits, which is a huge benefit for an aging pensioner. The NL government, however, has removed this benefit for those who do not retire with the government. In other words, if you leave government before retirement age, you will not be eligible for medical benefits even if you keep the pension in place. 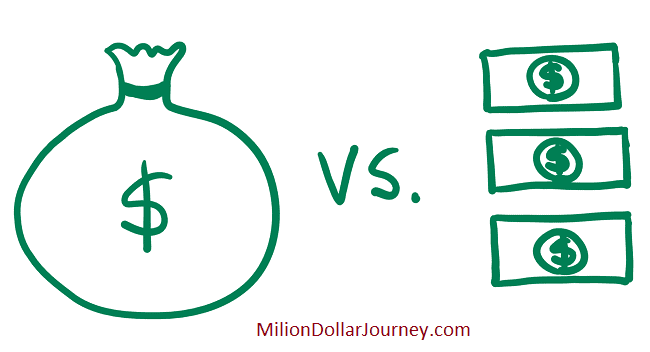 Control – If you didn’t know already, but when it comes to money, I tend to value control. With the commuted value, I can choose what to invest in, the amount to withdraw during retirement, and even use a lump sum if needed. Or, as mentioned above, we could leave a legacy for the next generation. The idea of the money essentially disappearing after I pass does not settle well with me. A few readers have asked about their pensions and what they should do with them. I hope that this article helps in your own decision. If we had a federal pension that was indexed to inflation and provided medical benefits, then we probably would have written an entirely different article. In addition, if you aren’t comfortable with DIY investing, then leaving the pension intact is not a bad idea. For me, it was a variety of factors that helped us ultimately make the decision to take the commuted value of the pension. The main reasons being: we can probably generate a higher income stream from the commuted value with 22 years of compounding at a higher rate of return; we can control the withdrawal rate during retirement which provides flexibility; and, the money doesn’t go away after my wife passes. Photo Credit: Mine. Yes, my art skills are equivalent to a 6-year-old. Excellent post. I have often wondered what I would (or perhaps will, since I am in my early 40s and have a defined benefit pension right now) do in the same situation. Excellent, straightforward calculation with a logical result. Happy investing! Heather, it can be a difficult decision depending on the perks around the pension. As I mentioned in the post, I may have left the pension in place if it was a federally indexed pension with medical benefits. Nice post. I probably would DIY as well, as the control, the lifetime potential legacy of the capital and, in 22 years, you’ll be able to meet those annualized returns (more than likely). Congrats on this! Remember that if your wife wants to return to a government job she can still add to that pension and commute it to a different Province if the need arises. Also My medical benefits will be allowed to kick in regardless of whether i am on a deferred pension if there is a life event (my husband loses his job and we now need to be insured). No medical is needed as long as you fill out the proper paperwork with the insurance company prior to leaving the job and keep paying union dues! It’s nice to have control yes but this pension is a gift in a market that may tank the last few years before retirement and that could possibly impact your retirement income! its just another diversification one that has options if you need it down the road!! Very good points Elizabeth. If we had the option of having medical coverage during retirement years, then the decision to withdraw the commuted value would have been much more difficult. Private health insurance for seniors can be very pricey and sometimes difficult to get if there are existing conditions. I think you made the right choice given the rate environment. The commuted value goes up substantially as the interest rates go down. So with rates where they were when you cashed out, you probably got the biggest commuted value possible. The annuity numbers you looked at are also based on today’s rates. If rates are to be higher when your wife would actually be 60 (they likely will), then the annuity cost to get that 7700$ annual income would be lower. Which means you don’t need as high a CAGR to break even, or you can get substantially higher income. Very good points nobleea, it justifies my choice even further! If mortality improves more than expected, that will drive up annuity costs even further. Were you worried at all about the money not being in the pension fund when your wife turned 60 and that is one of the reasons you choose to invest on your own? I am thinking about the Sears pension plan recent problems. Did you consider leaving the money in the pension fund as a form of diversification because the pension managers would invest differently than you would? I have a defined benefit pension and will be faced with the leave or LIRA decision in a few years myself but with much smaller amounts. Hi Beth, I’m not too concerned about the provincial pension, although you never know what could happen to it. If the pension was with a commercial entity, then I would probably even more likely withdraw the commuted value due to solvency risk. In terms of investments, I’m comfortable with DIY, so I’m not too concerned about having a different investment style. If you are in a similar situation, one option is to withdraw into a LIRA, follow a simple indexing strategy. I am not saying that the government will be going bankrupt or will be in financial trouble one day, but we all know that people who manage public money are not responsible spenders. The governing party can change the benefits if the pension is underfunded or it doesn’t have enough new contributors to sustain the pension. Taking the commuted value is the smart decision. The last thing you want to happen is during your retirement, your pension payments gets cut. Look no further than the Sears employees pension. Sad story. You never want to put yourself in these situations. I would never put my financial well being in anyone’s hand except mine. Thanks for the feedback Leo. Thanks John, I didn’t know that about taxation and non-residents. I like your approach to this topic. Not just for your own scenario, but the balance you present the argument in, as people seem to be more and more likely to take the commuted value, or at least consider and discuss it. Some have only even heard of it’s existence because of a friend who has told them how they took it, or a Financial Advisor has brought it up to them. In NL, this is especially the case as the Public Service Pension Plan in our province does very little to educate it’s members on it’s existence or how it works, and won’t tell members much about it until they have actually left or chosen to retire. This creates a scenario where people often think of it as this secret that the government doesn’t want you to know about and can create a biased opinion of it before even digging into how it applies to a person’s individual situation. People often take the advice of friends and co-workers that have already made the decision for themselves, but the issue is that the conversation typically doesn’t go into the specific financial details about why a person chose one option over the other, which leads to biases and potentially bad decisions. This article works because it goes into what makes the commuted value right for the individual, and provides not only the thought process but also a transparent view of the author’s financial situation to see how each component functions for their situation. A professional can help outline how the different factors may affect you, but nobody should state that one is definitively better, as the definition of the commuted value is that it is the economic equivalent to the future income stream. There is an issue that people should be aware of, this isn’t a short coming of the commuted value itself, but many Financial Planners, Advisors, Investment brokers etc. are specializing in these discussions, however they have a vested interest. Realistically, if someone is commission based, they need to you to take the commuted value to earn a commission on that investment. This doesn’t mean that all of them will push you into it, but they should be letting you know about this potential conflict of interest, and many aren’t. It is extremely important to have an open discussion about a topic like this, as it is a massive decision for a lot of people, and it’s a one and done type of decision. There is no going back. Thanks for the comment Danny. The choice to take the commuted value of a pension is certainly a personal decision. If I wasn’t comfortable with DIY investing, then I would probably choose keeping the pension in place over going with high MER mutual funds from a bank. Good choice MDJ. I also think you got the highest possible commuted value given where rates are now. I would also agree on the control and flexibility part of the decision as well. Thanks for sharing! This post actually gave me some great ideas for a similar scenario I’m currently looking at. Cheers! I have to make a decision on my defined benefit. I can take some of it $55K and put in a Lira. But the remainder $40K can only be paid out as cash so will be subject to tax. Does it make sense to take it out when it has a high cash component to be taxed? Hi Des, what is the monthly benefit during retirement? Is the pension indexed to inflation? What about medical benefits? GYM, are you planning early retirement as well? The thing about pensions is that they are all a little different. As I mentioned, if our pension had more benefits (like indexing and medical), then we might have kept it in place! P.S. I like the artwork, nice touch! Thinking of retiring in a year or so. Ontario Pension Plan is good but still not sure which way to go. Went to a pension info session and they did not even once mention about commuted values. The pension is indexed but no medical. I suspect that once you leave your position, the pension will send you a letter with the commuted value . Best to make your decision once you get all the facts . The advantage of taking it out is covered in one of your last sentences which some people may have missed. When you die the money is gone (assuming you did not take spousal benefit or you don’t have a spouse). Exactly that happened to a friends father. He retired after 35 years. His wife was still working and also had a pension at her work. So they did not take the spousal option. A year after he retired he died and no pension money after over 30 years of contributions. At least a LIRA can be left to anyone. The whole purpose of a DB plan is to spread the mortality and investment risk over a pool of people. Some people die early, some die later. If your friend had commuted to a LIRA and lived to 100 he could have risked outliving his income. They made a choice to not take the spousal option, and it resulted in a higher annual pension (and probably the right choice at the time since the wife had her own plan). Good article with some analysis! My question to you FT is, the commuted value of $54.5k that was presented to you, did they provide the details of how this was calculated? And did you feel it was a fair amount based on how much was contributed to the fund? I will hopefully be facing a similar decision in a few months and my biggest worry is that the fund will try and short change me if I take the commuted value. Jag no explanation was given as to how they came to the number. I just did my own calculations based on the offer that they gave. When it’s time to make the decision, make sure to take all factors into account. – Is it inflation adjusted? it depends say you are getting close to retirement in the next 2-4 years a pension of 2k per month not indexed to get that you need just over 1 million a year in the bank (bonds no risk) so if you take a buy out of cash there is no way they will give you a million dollars they will give you a lot less so now you have to take risk with say 400k (example only) to try and get that 2k per month. So sticking with company pension is better? Poor decision. You have simple done a reverse risk arb and placed the risk on your own shoulders instead of the company’s. You have determined the risk-free interest rate of the pension to be ~4.8% whereas the true risk free rate is much closer to 0%. If this is a government pension then you have truly handicapped yourself by 5% annually. Evan, I agree that this decision should not be taken lightly and we won’t all come to the same conclusion. However, I will say that given the same opportunity with the same numbers, I would make the same decision for our specific circumstance. Evan, does the “poor decision” statement apply to the assumed rate of return of the decision to transfer out of the DB? Because I see more than just the amount of dollars playing a role in the decision, for example, if the couple dies after the DB’s guarantee period (typically 5, 10 or 15 years – the longer it is, the lower the monthly pension), then nothing will be going to their children or grandchildren, or perhaps even their favorite charity. The self-managed route should also provide some flexibility in how and when the money is utilized, whereas once you start drawing from the DB, that’s it for life. Further, the Sears pensioner’s issue shows that DBs are not 100% guaranteed, perhaps they are to around 80% today, but lobbying by big business to relax such controls is relentless. I did the exact same thing and my DB was considerably higher. I came to the exact same conclusion and for me it ended up even better. I had to transfer a max amount to a locked in RRSP which was about 128K. That alone at 5% would exceed the value of my DB assuming i had retired at 60. On top of that, because my commuted value was more, I received a significant cash payout of which i maxed out my RRSPs to reduce my taxes. Even after taxes, I came out like a bandit with significant cash today and enough in my rrsps to equal what I would have received. I spent hours going through the numbers and receive two independent opinions. It was a tough decision, but its been a year now and I look back and would make the decision 10 times out of 10. Hey, just started reading your blog – awesome info here. An old co-worker of mine recently did the same thing with her DB pension. She had almost 30 years of service paid into it, and would have received about $5000/month in pensions but she took the commuted value only a few months before she could retire. She took home about $750,000 from the pension plan. I’d say it’s a great option if you’re comfortable with DIY investing or have a good adviser. Thanks so much for this post! I am actually in the exact same situation. Contributing to PSPP for last 4 years. I probably have around 60 K (my own contributions) and planning to leave later this year for a job in the US where I will be a permanent resident. So kinda planning to stay there for a while if I like it. – now, I had to deal with PSPP 2 years ago and their customer service is absolutely atrocious so I am having a hard time trusting them considering than I am only 30. It means leaving my contributions for the next 35 years and then hoping to get it back. I absolutely don’t trust them on this. – knowing that I may leave for the US, is it a good idea to leave my money to PSPP? Lisa, what province do you live in? Do you know if you are “vested” in the pension? In NL, you need to be contributing to the pension plan for 5 years in order to be vested. If you leave before being vested, they simply return your contributions. If you are vested, then your “commuted” value will be greater than your contribution + employer contribution. If you are in NL, after leaving an employer that is part of the pension plan, you will get a pension statement stating your commuted value and what you want to do next (take commuted value or leave it invested in the plan). As for what to do next, that will depend on your commuted value amount, and if you take the lump sum, how you plan to invest it. I am in AB and indeed vested after 2 years. Lisa, are you part of the federal Public Service Pension Plan? If so, you should be able to use online pension tools to get estimates on commuted value (or transfer value). The transfer value can only be calculated/estimated within 3 months of proposed departure date (due to fluctuating interest rates). Hope this helps. The only option I have is the projection calculator. Just wanted to let you know that I took the commuted value and now waiting for the transfer to my LIRA. I chose RBC because the easiest thing to do for me but I will probably end up transferring everything to Questrade or similar at some point. Hi, I’m having to face this situation myself and would like your opinion. The commuted value of my pension is $444,000, of which $90,000 would be taxed, if I took it out. It is a DB plan, which would pay $3200 a month, if I left it with my former employer. I don’t believe it’s indexed and there are no medical benefits attached. I would have 15 years to make the investment grow before drawing from the funds. Should I take it out? or leave it alone? I will take a look at the numbers, but one question to ask yourself is how would you invest the money IF you were to withdraw it? Would you leave it with an advisor? Invest it yourself? This is just the article I was looking for! I’m facing the same decision shortly where I am planning to step back from my full-time position as a nurse and wondered what I should do with my pension. I’m in favour of taking the commuted value because I think I can make it grow more than if I had left it sitting in my pension. I didn’t like the idea that the money would disappear after I die (never mind if I die early). And although the pension does transfer to a spouse after I die, because I’m a woman, I anticipate living longer than my future husband. I also like the idea of more control and possibly leaving unused money for the next generation. I have had people telling me not to do this however… they told me it would be insane for me to give up my defined benefit pension – these people are other nurses and some financial advisors. – with interest rates on the rise, commuted values are decreasing. You’ll need to run the numbers to ensure that investing the money on your own is the best bet. – if you stick with your pension, check to see if you’ll maintain medical benefits during retirement. If your pension includes medical, that can be big value for a senior. – if you are building your own portfolio outside of your pension, one strategy is to keep the pension in place and consider it your fixed income/bond allocation. I should mention I live in Canada so I didn’t have to worry about accounting for my healthcare needs when I retire. However I appreciate the insights you provided. I am sometimes impulsive in my decisions instead of taking the time to do my due diligence. When the time comes and I give up my permanent position, I’ll receive a document from my pension outlining what my options are. I’ll have more info then to help me make a decision once I find out the commuted value (I’ve only worked for 4 years at my current job). Hi Jaymee, we are from Canada too, and health insurance would cover prescription drugs, dental and other medical practitioners (physio, massage, chiro, acupuncture etc.) Yes weigh out your options once you get your document. Report back, maybe we can help. Hi, Thanks for the post. It is really informative. I’m facing a similar situation myself and would like your opinion. The commuted value of my pension came up to be around 25% less than sum of my contributions and my employer contributions and I wonder if it is right? Redd, that does not make sense but I guess it’s possible as they calculate commuted value based on interest rates . And with the trend of rising rates , I can see it impacting commuted values . In your case , it seems to make more sense to leave it in place . HI FT. We just found your blog today and are excited. It’s so nice to have a fellow Newfoundlander who can offer advice on things like this. We are in the unique position that my partner can retire in 1. 5 years but I still have 17 years left. He works for the provincial government and I’m a teacher. The goal ideally for us to be both FI in 10 years. We are investing in ETFs using Quest Trade, reducing our expenses and taking on side hustles (in retirement) so we can spend quality time together and have similar schedules. We are leaning toward my partner taking the commuted value of his pension. He would receive $33000 a year before taxes if he takes the pension. We have really no idea what he would get if he takes the commuted value at this point. We also have TFSAs and some money in RRSPs and rental properties. I also have an RDSP that I can draw from at 60 and if I deffer my pension, I can start receiving it at 62. Do you think, given our circumstances (he’s 51 and I’m 36) that it would be a good idea to take the commuted value of his pension in an effort to be FI in 10 years? Thanks! Hello D&C! Love seeing fellow locals going for FI! The only way to properly assess if taking the commuted value is the best move is if you get the numbers. From my experience, you can’t get the numbers until you actually leave the position. One thing to note though, with a rising interest rate environment, commuted values are going down (and fast!). Personally, if I could retire from the province in 1.5 years, I would stick around and take the pension (and the medical benefits). Is there a reason why you want to take the commuted value? Is it possible for your partner to keep working to keep increasing his pension? Will he want to be off while you are still working? Hi FT! Thanks for the quick reply! I think his main reason for wanting to take the commuted value is that he hates the idea that when he dies, the pension is gone. He has had some health issues in the past (luckily he is well now) and thus his outlook on things has changed. If he takes the commuted value, the money that he has put into it stays in the family. As for the medical portion, he can be added to mine once he leaves and then if I leave teaching, we would have to make a decision on what to do I guess. I may not fully leave teaching, but instead work part time or sub. He also intends to keep working, but at something else following his retirement. He is pretty burnt out from his current job and would like to leave sooner rather than later. He is fit and active so he definitely won’t want to fully retire. I guess we will have to wait and see how the numbers work when the time comes and see if it makes sense for us. Thanks for your help and we’ll keep reading your blog! One thing to keep in mind is that if you outlive your spouse, 50% of the pension benefit gets transferred to you – at least it was the last time I checked. Is the plan to leave an inheritance to the next generation? Would obtaining life insurance be an option?